Description of "IMMER NOCH TRAURIGKEIT"
"Poetisch gesehen Ihre Gedichte haben eine musikalische Qualität, und wäre gut als Texte für die Songs." "Es klingt wie ein melancholisches Lied." "Ich habe Ihre Gedichte gelesen." "Ich habe wirklich schätzen eure Texte zu lesen, traurig, sehr melancholisch, aber erfrischt." annotations of many holy verses of Sikhism. Several educational books were translated by him from Hindi and Punjabi to English. Sardar Paramjit Singh had already come a long way at quite young age and he has so many milestones ahead of him. We wish him to achieve many more laurels. 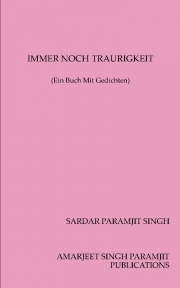 AGLE JANAM MOHE BITIYA NA KIJO by PREM GUPTA "MANI"
Reviews of "IMMER NOCH TRAURIGKEIT"